Do you ever have those days where you want an easy and healthy dinner but have no idea what to cook? I do! Especially, those busy and cold days in winter where salads or my normal go-to’s just won’t cut it. I was recently talking to my friend Kelly, who has to eat similarly to me, about this problem. We have vent sessions occasionally where we both complain at how inconvenient it is at times to not be able to grab take out from any old restaurant and call it good. During a recent jaunt down this old conversation, she mentioned to me her quick and simple Bacon and Cauliflower Soup. 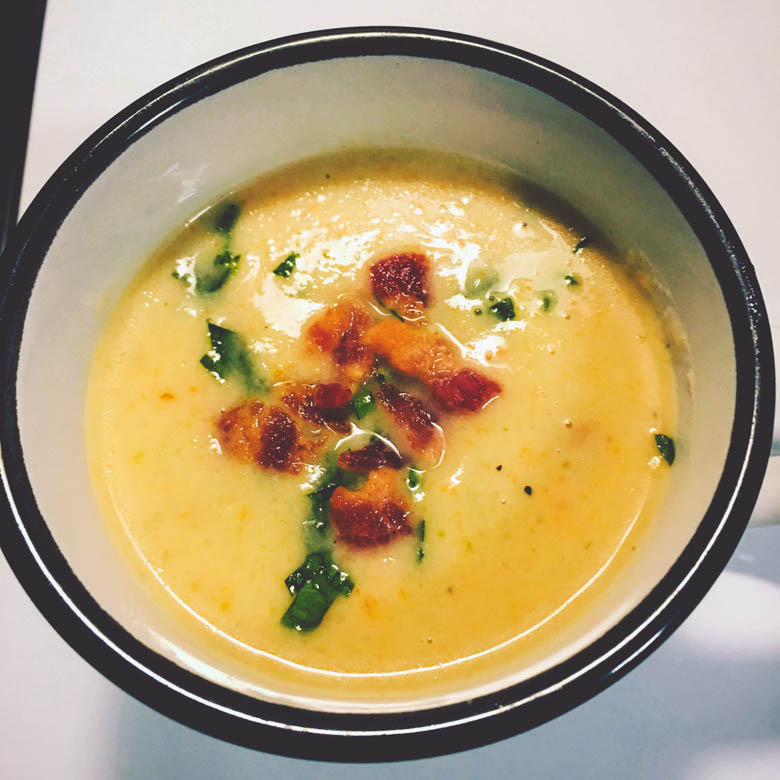 Being both AIP and Paleo approved, it is one of her go-to soups for busy days. I realized I had all of the ingredients and decided to try it for myself. The result was super yummy, healthy and kid-approved! Thank you to Kelly for being willing to share this recipe! The more I cook with cauliflower, the more I realize I love this incredibly versatile veggie! Pre-heat a 12-qt. pot over medium-high heat. Add your chopped bacon and cook until crispy. Remove the bacon bits and reserve, leaving the bacon grease in the pot. Add carrots, onions, and celery. Cook, stirring occasionally, until onions are translucent and carrots and celery are soft. Remove from the pot and reserve. Add coconut oil to the pan. As soon as the coconut oil has melted, add garlic, sautéing until fragrant. (Do not burn!) Add cauliflower florets, coconut milk and bone broth. Allow mixture to come to a boil, then adjust heat to low or medium low (allowing the mixture to simmer) and cover. Let simmer until the cauliflower florets are soft and tender. Add the carrot, onion and celery back into the pot. Using an immersion blender to purée the vegetables in the mixture. Once smooth, add salt 1/2 tsp. At a time, adjusting for taste. If not AIP, add pepper. Simmer for 5-10 more minutes, until the flavors are blended. Remove from heat, top with bacon bits and parsley. Season with salt and pepper to taste. For chopping the bacon, I use kitchen shears when the kids are around. It makes it so much easier! This looks so yummy! I will definitely be making this next week!